CR claims the Model S lacks a major safety system that all cars should have. Thanks to watchdog groups like Consumer Reports, automakers have yet another layer of standards to meet alongside those enforced by the government in order to ensure that the car in your driveway drives worth a damn and holds up to the trials imposed on it by a harsh life on the road. Tesla has been both in the good graces of Consumer Reports as well as under its fire, but that’s expected of a newer automaker that lacks experience. Unfortunately, the publication has once again reprimanded Elon Musk’s car company, this time citing a problem with its safety features. The technology in question is Automatic Emergency Braking, a relatively new feature in the industry that uses forward-facing cameras and radar to sense if the car will hit another car or an object ahead. If it computes that a crash is imminent and the driver has taken no action, it will automatically apply the brakes to prevent a crash or mitigate the damage of one, potentially saving lives, injuries, and costly repair bills. The Consumer Reports agenda is to have all automakers offer it standard, and has implemented a system of boosting safety ratings for cars that follow that guideline. 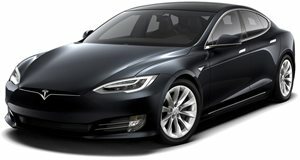 The Model S and Model X previously included the AEB system as part of the package, but due to software problems, Tesla has not included the feature in cars produced after late October 2016. The Model S once sat atop safety ratings for the ultra luxury segment with a score of 87, but after losing two points, it now ranks behind the Lexus LS and BMW 7 Series. The Model X dropped from 58 to 56, placing it close to the bottom of the luxury midsize SUV category in terms of safety. Tesla has told CR that it will begin sending out over-the-air updates for its cars beginning April 27th, but it could take up to two weeks for the new code to make it to all new Teslas. Part of the reason for Tesla’s delay has been Autopilot 2.0 hardware, which promises fully autonomous driving at some point in the future, but came at the expense of features like AEB, which needed to be reengineered to work with the new hardware. At least the wait will soon be over according to Tesla.